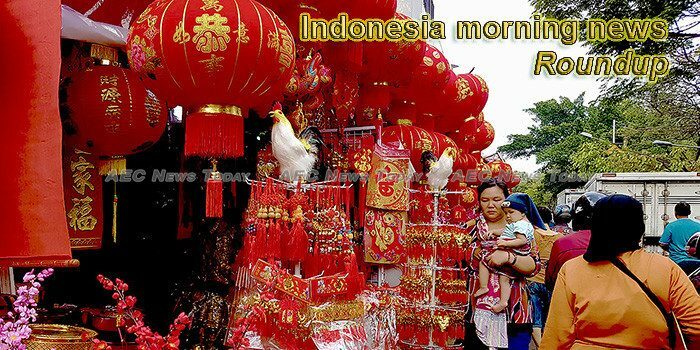 More than 15.81 million tourists visited Indonesia last year, up 12.58 percent from 14.04 million a year earlier, said Tourism Minister Arief Yahya, quoting data from the Central Statistics Agency (BPS). Inflation was recorded at 0.32 percent in January, far lower than the rate in the same month in the previous two years, which stood at 0.67 percent and 0.97 percent, respectively, Statistics Indonesia (BPS) announced on Friday. The Meteorology, Climatology and Geophysics Agency (BMKG) recorded 52 aftershocks as of 09.00 p.m. on Saturday after an earthquake of magnitude 6.0 hit Mentawai Islands off the western coast of Sumatra Island earlier in the day. Intellasia East Asia News Indonesia wants to re-position its Batam island as an alternative shipping and manufacturing hub to Singapore with a potential to draw $60 billion in new investment. The Corruption Eradication Commission (KPK) has named East Kotawaringin Regent Supian Hadi a suspect of graft in a case that may have caused more than US$415 million in state losses. Indonesia is willing to help the Philippines investigate twin blasts that killed 22 people and wounded nearly 100 others in Jolo, Sulu province, a week ago, Interior Secretary Eduardo Año said on Sunday. Chances of Australia and Indonesia signing off on their Free Trade Agreement before the federal election are slim owing to the ongoing fall-out from government’s overture towards Israel late last year and the looming Indonesian elections. A respected Muslim cleric is in the spotlight after a video of him mistakenly praying for Prabowo Subianto to become “a leader” during an event attended by President Joko “Jokowi” Widodo went viral on the web. Analysts have raised doubts over claims made by a senior Philippine government official that an Indonesian couple was behind the church bombings in the southern Philippines, citing a lack of evidence. Indonesia Property Expo is officially commenced today, February 2, at Hall A and B of Jakarta Convention Center, Senayan, Central Jakarta. ndonesian Vice Presidential candidate Sandiaga Salahuddin Uno has pledged to make Indonesia the fifth biggest halal economy in the world if the Prabowo Subianto-Sandiaga Uno pair win the upcoming presidential race. Facebook has removed hundreds of Indonesian accounts, pages and groups from its social network after discovering they were linked to an online group accused of spreading hate speech and fake news. President Joko Widodo (Jokowi) has called for the implementation of disaster education in every educational institution starting this year. Almost everybody has to spend a huge chunk of their lives on the internet nowadays to do everything from work to socializing to shopping. The latest case of obesity in Karawang, West Java, has yet again shed light on Indonesia’s rising obesity problem. The Nusantara Palestinian Center (NPC) Foundation has planned to distribute 10 thousand liters of diesel fuel to assist hospitals in Gaza that are facing a prolonged humanitarian crisis as a result of Israel`s 11-year-long blockade. The University of Indonesia (UI) has carried out a strategy of curriculum development in study programs in an attempt to face various challenges in the era of global competition, Rector of the University of Indonesia (UI) Prof. Muhammad Anis remarked. Wouter Van Wersch (GE)General Electric (GE), a Boston-based industrial giant that entered Indonesia in 1940, is set to focus on electrifying Indonesia for the next six years. When President Joko “Jokowi” Widodo began his tenure in 2014, he uttered his wish to finish a number of infrastructure projects immediately, including the construction of a highway and a railway in Kalimantan. Indonesia believes that Japanese investment in Indonesia, particularly the portfolio one, still has potential to increase. Intellasia East Asia News An Indonesian police officer has been arrested for allegedly taking a bribe to help a French drugs suspect escape from jail, authorities said Friday, as the search for the fugitive continued. The population of Komodo dragons at the Komodo National Park located in West Manggara, East Nusa Tenggara Province, reaches 2,897 and is considered to be stable. Several policemen have turned preachers at mosques in Bukittinggi, West Sumatra Province, as part of the local police`s measures to deal with potential threats of the proliferated ideology of radicalism in society.